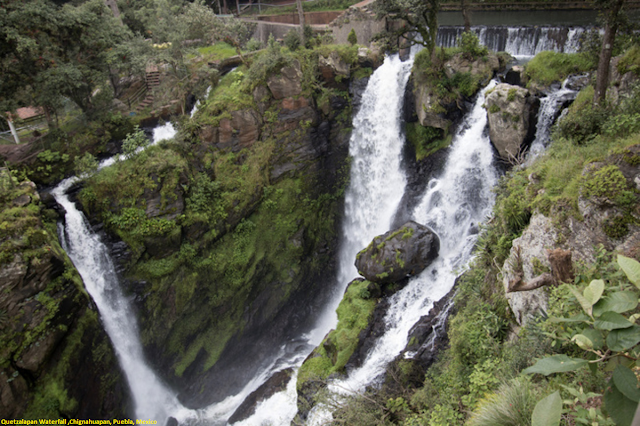 The Quetzalapan waterfall is one of the most impressive and most visited waterfalls in the region, with a drop of 100 meters over a pool of thermal waters.At the top there is a recreational area ideal for families that offers different activities of adventure and extreme sport, such as zip-lining, hiking, high tension and archery. It also offers different services such as viewpoints, cafeteria, palapa area, grills, toilets and parking. The Salto de Quetzalapan is located between the limits of Chignahuapan and Zacatlán, from Puebla it is at a distance of 115 kilometers.The waterfalls can be covered on foot by a path of stairs that reach the lower part. It is said that they are exactly 365 steps and that these were built one by one during a whole year.You can spend the night in the same park, if you like to camp. If sleeping outdoors is not your thing, the option is to transport to Chignahuapan, which is 15 minutes from Quetzalapan, there you will find hotels or cabins at very affordable costs. The atmosphere of this place is perfect both for a family trip, and to enjoy with friends. You decide whether to live a quiet and comfortable stay or a crazy adventure, of what if there is no doubt, is that you will love it.